How MMO can a keyboard go? Of all the gaming peripherals, keyboards have to work hardest to convince you that all those backlit keys and brushed steel signify a tangible and worthwhile step up from the basic beige model. Okay, it's always going to be tangible by definition, but compared to a low-friction, high-dpi mouse, the advantages of a keyboard like the Corsair Vengeance K90 are less evident. It's designed for MMO players and so everything beyond typing the alphabet is geared toward long play sessions and macro functionality. Built to a similar design as the K60 FPS keyboard, the K90's backlit with blue LEDs that can be adjusted in four levels of intensity from off to extremely bright. 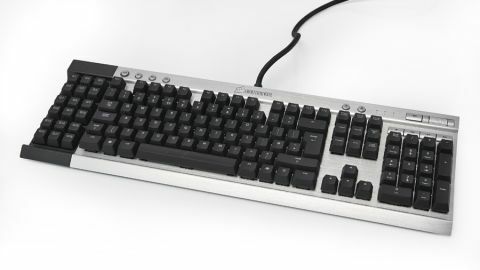 We would have preferred closed-off, individually backlit keys to match the clean and clinical design language in every other element of the keyboard - the light bleeding out of the space bar and arrow keys feels messy, but it's a by product of the minimalist brushed steel chassis that otherwise exudes great build quality. Key lighting is handy not just for MMO players, but for anyone who's played a video game beyond 6pm, so it's in good stead with the gaming majority so far. Macro recording and a bank of macro keys labelled G1-18 (the G-Unit, if you will) is the other significant modification from the K60. Those 18 keys can each hold three functions, as pressing the M 1 to 3 buttons will cycle through three banks - we doubt you'll run out of macro keys, is the long and short of it. It's simple to program a key - a matter of hitting 'MR', performing the required key strokes and rounding it off by hitting the macro key of choice. And that's your lot as far as MMO gaming goes, but there's a lot more to like from a general gaming perspective. The caps/num/scroll lock lights are beautiful, it's built with a steel volume control roller that matches the one on Corsair headsets and the Cherry MX red keys feel just as satisfying to caress on this board as they do on the K60. It's just that the MX Red switches aren't found beneath every key. The macro keys (G-Unit), F1 to 12 and the bank above the arrow keys ([insert], [Home], etc) feel cheaper than the keyboard that came with your first Amstrad, and that glaring incongruity makes you wonder how much more it would have cost to just stick MX Red switches everywhere. The only other negative to the K90's good name is a lack of mini-jack support on the board's inputs - there's just one USB 2.0 slot for a mouse or headset and most we've seen in this price range carry more than that. Easy headset connectivity's a biggie for MMO gaming, when all's Ventrilo-ed and done. This is a keyboard you'll find yourself making excuses for though, because day by day, tap by tap, it becomes a luxury you can't imagine gaming without. You don't need those delightfully clicky keys and that rugged build, and you could probably survive without the LEDs. But if you're in a position to shell out for it, your opulence will be rewarded with an almost exemplary level of functionality.